If you have endless funds, don’t need an income for 6 years and aren’t scared of a lot of hard graft then creating a vineyard is just right for you! This is what Andy and Sarah Pharaoh decided to do. 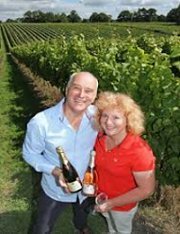 In 2007 they bought the 23 acre Flowers Farm at Lytchett Matravers and planted 23,000 vines, a mixture of Chardonnay, Pinot Noir and the lesser known Pinot Meunier. This selection of vines enabled them to embark upon their dream of producing top quality English sparkling wines. Thus was born the English Oak Vineyard. The Bon Viveur group led by Richard Tucker visited Flowers Farm on Friday 28 September where our hosts Andy and Sarah greeted us. Andy kicked off the afternoon by telling us the story of their decision to establish a boutique vineyard with a view to producing top quality wines. The grape varieties were chosen with that specific object in mind. Sarah followed up with a stroll around the vineyard to explain the horticultural aspect of the business. We tasted each of the grapes in turn. The first three years were spent nursing the vineyard protecting the vulnerable vines from hungry rabbits and other marauding beasties. At the end of the third year the vines produced the first crops of grapes. The production of sparkling wine takes a further three years. Forget the image of bare-legged peasants leaping up and down in a tub. Oh no, it’s all mechanised now. Off by truck go the grapes to a Sussex winery. After blending the wine produced by the three different grape varieties, adding extra yeast and sugar and the gradual rotation of the bottles to increase the body of the wine, the resulting plug of lees is removed by freezing the very top of the bottle. When the crown cap is removed the pressure inside the bottle shoots out the plug. Then it’s down to more relaxation for the wine to recover until, at the end of the final three years, the bottles receive their labels and other decoration. Now it was time for us to sample the three wines on offer, two white and one rose, all of which have already achieved very high ratings from the various competitions into which they have been entered. Andy and Sarah are justifiably proud of their success in such a short space of time. The chilled wines provided a welcome finale to a warm afternoon. Richard offered a vote of thanks for the amusing and informative visit. Several members of the group then purchased bottles to add to their already extensive cellars.